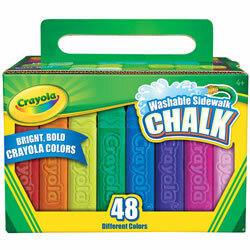 Encourage children to create using their imagination and Kaplan's extensive collection of color chalk. 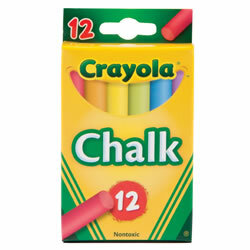 Options include chalkboard, sidewalk, and drawing chalk as well as erasers, pastels, and sidewalk paint. 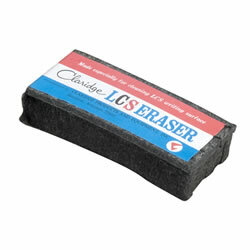 Clean your chalkboards or markerboards with this durable, long lasting eraser. 5" x 2" x 1 1/4". 24 bold, bright and strong colors with easy wet / dry blending. 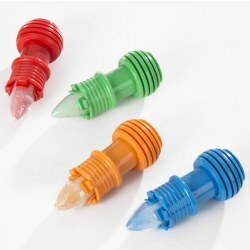 Comes in an easy open, protective sleeve packaging. 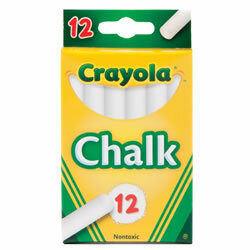 Chalk stick size is 3 1/4" x 3/8". 3 years & up. 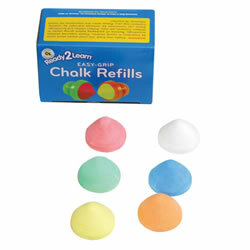 Four sturdy chalk sticks and four durable chalk holders come in this multicolor first chalk set. Adjustable plastic holders have a ridged ball end that's easy for beginners to grip as well as a textured band to encourage emerging tripod grasp and abilities. 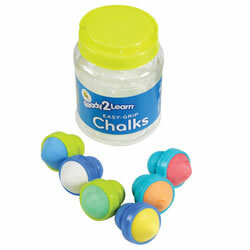 The easy-to-adjust holders keeps chalk dust off hands. Refillable and reusable. 3 years & up. 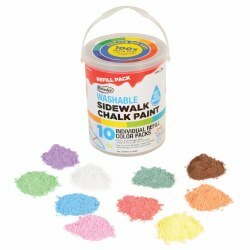 Just add water, shake or stir, and turn powdered chalk into washable sidewalk paint. 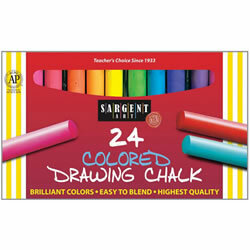 Includes ten colors, 2.65 ounces each, and a color mixing guide for making additional colors. Mixing container and stir stick not included. 5 years & up. Combine the artistic possibilities of sidewalk chalk with the added variety of paint-application methods to create amazing images. You have the freedom to mix colors and create blended colors in a multitude of shades, limited only by your imagination! Use the included brush and sponge roller to create interesting textures and effects. 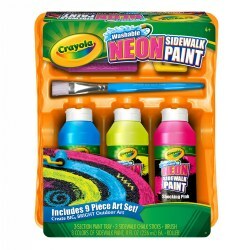 Set includes integrated painting tray, 3 colors of paint, brush, sponge roller, and sidewalk chalk. Made in the USA. 5 years & up. 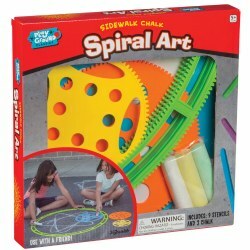 Create incredible geometric spirals with sidewalk chalk! Snap the tracks together and roll a stencil along the ridges like a cog. It's like a giant-sized Spirograph® toy set! Set includes a wheel, nine stencils, and three pieces of chalk.